It’s time to twist and shout! Yes, the 50’s Vintage Dress doll clothes pattern for 18 ½ inch Cabbage Patch dolls is now available. I want to thank all my wonderful Cabbage Patch doll clothes patterns customers for being soooo patient as I’ve taken a little longer to release this 50’s Vintage Dress pattern but I know you’re going to love it. Just like the 18 inch pattern, I’ve included all the variations so you can make lots of different dresses that will all look absolutely gorgeous! 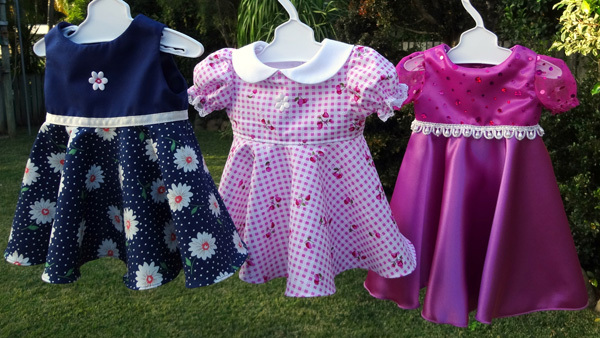 You can make a pretty party dress with puff sleeves or a sweet sun dress without sleeves. Make it with a collar for a little style or without a collar for a more casual look. And I’ve also included the pattern variation so that you can make it long as well as short. Use shiny satin, rich velvet, overlay lace or fancy tulle on the bodice or the skirt and add some sparkly ribbon or glittery trim for a more elegant evening gown. For the classic 50’s look, make the dress without sleeves and add the sweet Peter Pan collar. I’ve added a white belt and some white buttons to make this dress really ‘pop’. Or you can add lace to the edges of the puff sleeve or to the hem of the dress for a super cute look. The combinations and variations are endless. This pattern is a joy to sew for the beginner to intermediate sewer – you will be sewing around curves, hemming a circle skirt and working with elastic for the sleeves but Rosie will show you every step of the way. Yes, as with all my patterns, this pattern comes with 12 months access to my step-by-step video instructions which make it even more fun to sew. Click here to get your pattern today! P.S. I’m trying to be a little creative with my photos and would love to know if you like the garden photos or would prefer to just see the outfit on the doll without the background.